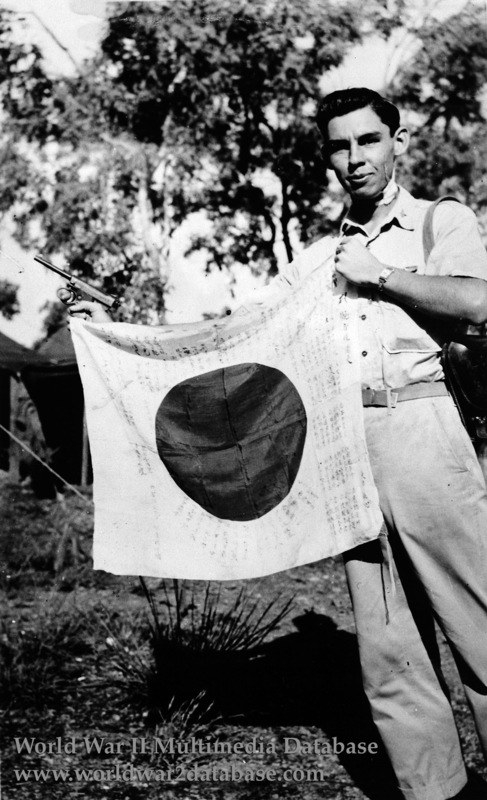 Lieutenant Joseph W. Cochran (1919-1975), a part Cherokee Native American from Talaquah, Oklahoma, holds a Japanese flag and a type 14 officer's pistol liberated during the Sanananda operation. His neck wounds are bandaged. A Boeing B-17E Flying Fortress bomber pilot with the 43rd Bomb Group, 5th Air Force, Lieutenant Cochran earned the Silver Star, Purple Heart, Distinguished Flying Cross, three Presidential Unit Citations and an Air Medal. In March 1943 his entire crew was wounded except for one man. The enlisted man and Cochran wrestled the damaged plane back to base. Cochran was shot in the neck and had to wait three days for a delicate surgical procedure to allow the swelling to go down. He was promoted to Captain and went to New York City for a publicity tour and appeared on radio with Ogden Nash and Greer Garson in a forum sponsored by the Herald Tribune. The 43rd Bomb Group arrived in New Guinea (stationed at Jackson Field, also known as Seven Mile Drome) on January 23, 1943 without adequate training; many, including Cochran, had no time in four-engine bombers before leaving the United States. After recuperating in Sydney, Cochran returned to combat; his neck carried a scar for the rest of his life. After the war he became an Artist Professor at Tulsa University. 25,000 men and 700 women Native Americans served during World War II. 132 Oklahoma Native Americans were killed and 166 were wounded. Native Americans won two Medals of Honor, 71 Air Medals, 51 Silver Stars, 47 Bronze Stars, and twelve Distinguished Flying Crosses. Unlike segregated African American and Japanese units, Native Americans were fully integrated into the US Army and Marine Corps.